This month’s interview is with talented and accomplished US-based calligrapher, Linda Yoshida. Have you often found yourself staring at beautiful handwriting and lettering, wondering how someone created it? 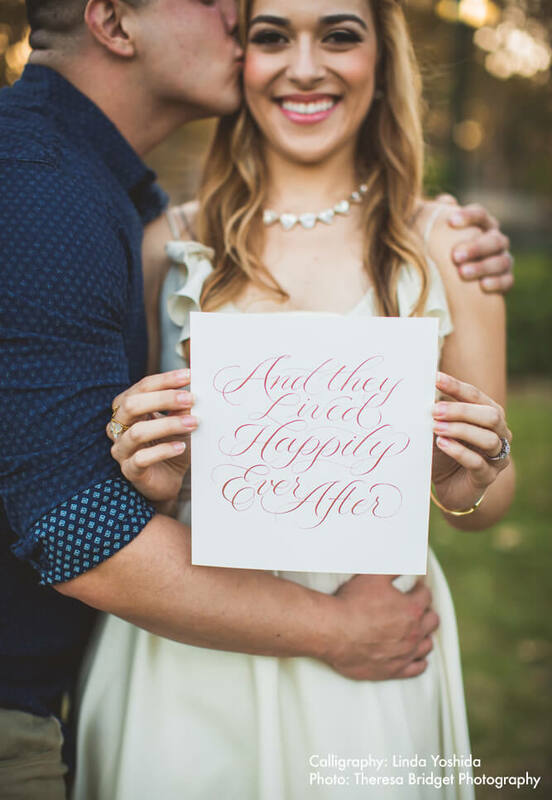 Or have you ever daydreamed of becoming a calligrapher yourself? Grab a cuppa, and have a read of our chat with Linda, as we find out what it takes to be a successful calligrapher. Hi Linda, I love your work! Do you enjoy your job? Thank you so much. I work as a graphic designer during the day and calligraphy is my side job. I sit in front of a computer all day, so when I am home I really enjoy working with my hands to create letterforms with calligraphy. I am very fortunate to have the flexibility and opportunity to do so. ​​When did you first develop an interest in calligraphy? My first ​introduction to calligraphy was in the sixth grade [at age 11-12]​. ​My teacher had the most beautiful handwriting and taught us basic Italic Hand. I was so inspired by her that I would sit at my desk after finishing my homework and practice my cursive over and over. Since then, I have continued my love of letterforms by studying graphic design and typography, then through working as a web designer and graphic designer. How long have you been working as a calligrapher? I have always done calligraphy for friends and family, but my first real commission was a referral from a calligrapher friend in 2012. She ​was booked ​for the job months​ in advance, but couldn’t do it because she was pregnant and the baby arrived earlier than expected! So she asked me to take over. Everything went very well despite the pressure and the rush, and I gained some great experience from it too. As it’s not a conventional career choice, how did you know what training to opt for? Did you have a mentor to guide you? Many practicing calligraphers are self-taught and there is absolutely nothing wrong with that, but I knew early on that if I was to be serious about the art and craft of calligraphy, I had to learn it the right way, which is from professional calligraphers. Thankfully, there is a very active calligraphy guild in my city: the Society for Calligraphy in Los Angeles/Southern California. I found the guild through a web search, and then found some wonderful teachers through the guild. I studied with Yukimi Annand in her studio for two years, and ​I have also attended​ workshops taught by senior calligraphers in my guild. It’s the best thing I’ve ever done for myself as a calligrapher. 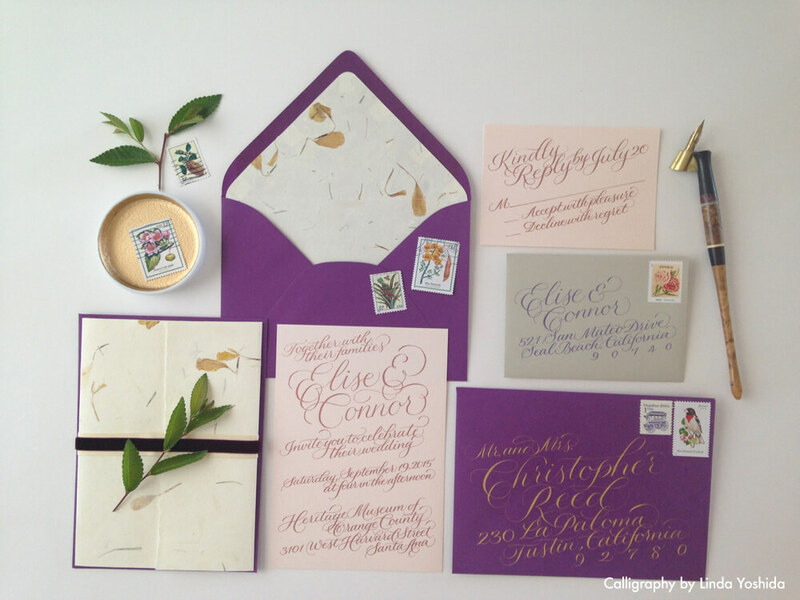 What skills do you need to be a calligrapher? What tips would you give to somebody who aspires to work as a calligrapher? Be humble – there is always something to learn, and there will always be someone who is more skilled than you. Be patient – calligraphy skills cannot be achieved in one day, one week, or even one year, if you don’t practice​ mindfully​. Be diligent – practice does not make perfect, but it does make progress. That said, I am still working on all of the above, reminding myself to try to be those things every day! What have been your favourite projects to work on, and why? A wedding photo shoot featuring Linda’s work. Which pens, paper and tools are your favourites? I prefer dip pens and nibs – my favorite broad edge nibs are Brause Bandzug and Leonardt Tape, and my favorite pointed nibs are Brause 66EF, Titanium Zebra G, and a few vintage nibs. ​For pointed pen practice, I love Clairefontaine or Rhodia lined pads! They are so smooth and lovely to write on. ​For broad edge, I like using Arches hot press watercolor paper and Canson Mi-Teintes paper. ​For ink – ​walnut ink is my absolute favorite. I also really like​ ​Moon Palace ​sumi ink, vermilion ink, PearlEx pigments, FineTec gold palette, Schmincke Calligraphy Gouache, ​and Winsor & Newton Designers Gouache. I also love the convenience of using fountain pens and inks – my mother gave me her vintage 1960s Parker fountain pen​s that I still use today, and for quick practice, I use a Lamy Safari with a 1.5mm Italic nib. Some of my favorite brands of ink are Diamine, J. Herbin, Noodlers, and Pilot. What are your plans for the future with your work? I still consider myself a student of calligraphy – I am inspired by my teacher Yukimi Annand and I see her as one of my calligraphy role models. I would like to keep working, learning, and eventually, I would love to teach calligraphy. Thank you so much for the opportunity to share my thoughts on calligraphy! Thank you, Linda! For more examples of Linda’s work, please visit her website, or follow her social channels.